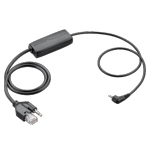 This is the Plantronics APC-45 EHS cable for for remote desk phone call control (answer/end). This cable eliminates the need for a HL10 Handset Lifter.This cable works with Cisco IP Phones. Configuration change must be made through the Cisco Web Interface. Connect to the Cisco SPA phone using a web browser.